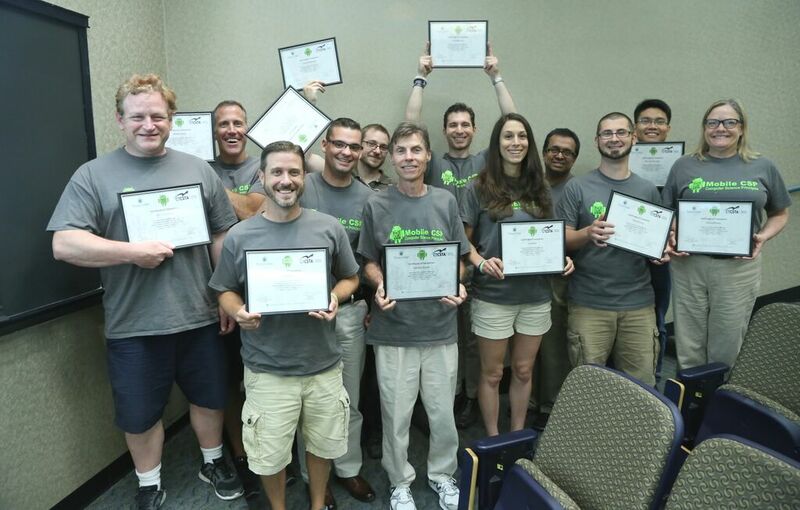 Teachers in the 2015 cohort completed the Connecticut edition of the Mobile CSP Professional Development course. This year's PD used a hybrid model -- three weeks of in-person classes and three weeks of online work. Weeks 1, 3 and 6 were held on the Trinity campus. Teachers (L to R): Gregory Chandler, Enfield High School, Matthew Eppler, South Windsor High School, Scott Kaminski, Trumbull High School, Matthew Lane, Ellington High School, Phillip Mangiaracina, Platt High School, Meriden, Lawrence Bojarski, South Windsor High School, Christopher Kerr, Newington High School, Dana Kinel, East Hartford High School/Connecticut International Baccalaureate Academy, Chandan Sarkar, Westhill High School, Stamford, Anthony Truss, Conard High School, West Hartford, Allan Ray Tanchiatco, Maloney High School, Meriden, Michele Murphy, East Lime High School. As in past years, the teachers created some amazing apps for their final projects. Click here for detailed descriptions of each project and for QR codes to download. Financial Tracker, a budgeting app that tracks and summarizes purchases, Anthony Truss and Chandan Sarkar. EasyText, a simplified texting app for people that may have difficulty speaking due to various medical issues, by Dana Kinel and Matthew Lane. Shopping List, an efficiency app that enables a group of people to have a shared shopping list, by Scott Kaminski and Michele Murphy. Scholar Dollars Application Suite, a set of applications that enables teachers to reward and encourage positive student behavior, by Christopher Kerr and Allan Ray Tanchiatco. Math Quiz, a quizzing app designed to assist students with basic mathematical knowledge in the areas of Algebra and Geometry, by Matthew Eppler and Lawrence Bojarski. Order Riddle, an educational application to help students learn the order of numbers, by Gregory Chandler and Phillip Mangiaracina.